The Stones lean and mean on their '78 tour. The late 1970s offered a stark contrast in terms of popular music styles. There was the bloated excess of disco – arguably at the height of its powers – dominating the charts and the club scene, especially in places such as Studio 54 in New York. Tipping the scales in the other direction was the punk scene, which stripped rock ‘n’ roll back to its most pure elements – high energy, guitar, drums, bass, snarling vocals. Punk helped put the danger back into rock music. The Rolling Stones managed to embrace both on their seminal release, Some Girls, with a country song added in for good measure. “Miss You” was full-on disco, but with a Stones edge and came as a result of Mick Jagger’s frequenting of the New York club scene. The rest of the album while not punk certainly shared its raw nature and energy. Gone were the backup singers and horn sections and, in their place, was the World’s Greatest Rock ‘n Roll Band doing what it does best – playing stripped down, powerful music. The band took this attitude on the road with them for the ensuing tour, which is captured on the Blu-ray The Rolling Stones – Some Girls Live In Texas ’78. Emphasizing this back to basics approach, the concert opens with an energetic cover of Chuck Berry’s “Let It Rock” with Jagger, clad in a yellow jacket and red hat, owning the stage from the first minute. The band keeps up the frantic pace with a fantastic “All Down The Line.” Bill Wyman’s bass is upfront in the mix throughout and the track features some sizzling slide work by Ronnie Wood. After a lengthy intro, the band launches into their classic, “Honky Tonk Women,” with guitarist Keith Richards doing his best Berry impression on lead guitar. Jagger and Richards share the microphone on the chorus, something sadly missing from modern-day Stones performances. In a bold move, the band plays seven of the ten songs from Some Girls in a row. Only “Lies,” which was played on some nights, “Before They Make Me Run” and “Some Girls,” which didn’t make its live debut until many years later are omitted. Jagger is also featured on guitar a lot more on this tour than in past Stones tours, playing on many of the Some Girls cuts. The Some Girls portion opens with a gritty “When the Whip Comes Down.” The song loses none of its power from the studio version and has Wood and Richards sharing a mic for the background vocals. “Beast Of Burden” is even more heartfelt than the studio version and is much longer, with some great soloing from wood. “Miss You” is tougher than its studio counterpart, with Richards and Wood practicing their “art of weaving” onstage with some great dueling leads while Jagger takes to keyboards for the classic country of “Far Away Eyes,” which also features Doug Kershaw on violin. It’s songs such as “Respectable” and “Shattered” however that really shine in the live setting. Played much faster than the studio versions, they are dripping with an intensity that would rival any band. The band rounds out the set with some old warhorses, including high-energy versions of “Brown Sugar” and “Jumpin’ Jack Flash.” The set list is notable in that, save for a few numbers, most of the songs are from the 1970s, making for a then very-current set list. Most older acts, including the Stones, couldn’t get away with that now. The band is backed throughout by the late Ian Stewart on piano and Wood’s old Faces band mate Ian McLagan on keyboards. The show was shot on 16mm film and has been cleaned up considerably for release. There is still some grain visible (This was never intended for a high-resolution release), but it is noticeably better than any of the unauthorized versions that have circulated over the years. The sound has been remixed and remastered by Bob Clearmountain from the multitracks and is presented in DTS-HD Master Audio, Dolby Digital 5.1 and LPCM Stereo. Throughout, the mix is clear and in your face – just like the music. 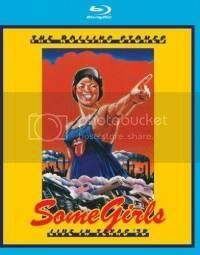 Some Girls remains one of the Stones most consistent and best-loved albums. The tour for the album was even better. This is the Stones playing with something to prove to show the Punks they still had it – and did they ever. Some Girls Live in Texas ’78 is one of the finest live documents of this great band ever captured.